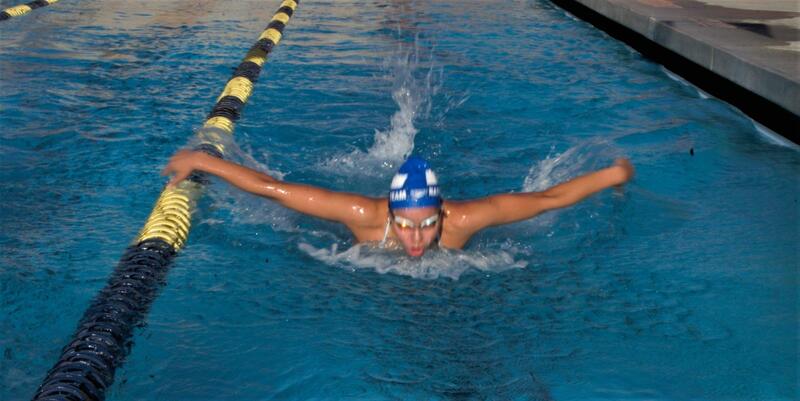 Senior Julissa Arzave at her weekly Saturday morning practice, doing butterfly strokes. Seconds seem nearly insignificant to our everyday lives. However, in the swim world, mere seconds set Bonita Vista High School senior Julissa Arzave apart from her competitors. This caught the attention of the University of California, San Diego Swimming Coach David Marsh, former head coach for the 2016 Rio Olympic Swim Team. Arzave recalled being two years old and standing at the pool deck to watch her older sister swim. She began swimming at three years old when her mother encouraged her to start taking lessons. “One day I knew that I wanted to join swimming. [My mom] actually wanted me to get involved with other physical sports so then she allowed me to start swimming,” Arzave said. Arzave has stuck with South Bay Aquatics, her competitive club swim team, ever since she started swimming. According to Tom Paradowski, her current coach of three years, Arzave has improved tremendously over the years. “We’ve seen a constant progression from when she started with my group. She was a strong age group swimmer and now she’s progressed to the point where she is one of the top distance swimmers in the country her age,” Paradowski said. According to Paradowski, Arzave is recognized as one of the top open water swimmers in the country. This past summer, she attended a selective, National Open Water Select Camp which invites 12 boys and 12 girls from around the country based on their performance. “Most swimmers at the top level in the country train in the water about 20 hours a week. On top of that, they do dryland and strength training outside of the pool. To compete against the best you have to do what the best swimmers are doing and that’s what it takes,” Paradowski said. Arzave works daily, whether it is in the water or dry land training. Dryland training consists of various exercises, including weight training to improve a swimmer’s strength and speed. “Swim really is a very difficult sport; it’s year round. It’s not just seasonal and the U.S is the top country in the world in swimming so the competition is at a very high. To compete at that level you have to put in a lot of work, hours and dedication,” Paradowski said. Azrave explains that swimming is one of the few sports that require constant movement of the whole body. To account for this, Azrave goes through hours of training every week. “She now has increased the weight she lifts significantly and we do complex functional training. As a swimmer, I hope it is transferring over to her speed and is a reason she continues to improve,” Arzave’s personal trainer Cindy Pangelinan said. Arzave trains in the morning and the evening, having practices at 7 a.m. on the weekends and before school starting at 5:30 a.m. This includes as long as two hours of pure swimming. Nevertheless, she always manages to perform and give her best effort, according to Paradowski. Even on her Sundays off, Arzave occupies herself with extra training, whether it be yoga or a cycling class. “She has been a real pleasure for me to work with, to have somebody that has shown such dedication and hard work. As a coach, that’s all you could ever ask for from your athletes. On a daily basis she comes in and does her best and [I’m] just very proud of her,” Paradowski said. Arzave is not only a full-time swimmer but an International Baccalaureate student. Arave explains how she frequently has to sacrifice time spent with friends and family in order to swim or to complete homework. Pangelinan states that this work has paid off, as Arzave was scouted for and has verbally committed to UCSD’s swim department. “I wanted her to be able to swim at a college where she feels proud of her accomplishments and where she feels she can continue to achieve her goals. Committing to UCSD does both, and she will receive one of the best educations out there. She has worked so hard in school and swimming that she deserves every bit of her success,” Pangelinan said. According to Paradowski, Arzave has improved the recognition of South Bay Aquatics with her accomplishments. Not only this, but she is also an inspiration to the young swimmers within her club. “It’s also shown our younger kids that it is possible to reach those elite levels of swimming on our club. It gives them the hopes and dreams that they can reach that level,” Paradowski said. Arzave continues to train each day and works hard in school. She aims to one day become an Olympic swimmer. Both Paradowski and Pangelinan believe she can achieve this goal if she continues with her hard work and dedication. “Getting that national goal was the moment where I realized I could control my mental side of things. Swimming is a mental sport, and being able to realize that I had finally overcome this huge barrier through tricking my mind into thinking that I can do this was definitely a big milestone for me,” Arzave said. I love your lede! It inspired me to continue reading and what a great story about a laudable student achievement. I like how the coaches really wanted to match Ms. Arzave with a school that provided both an excellent place to swim and an excellent place to receive an education. I would have liked to hear more about how Ms. Arzave balances the high demands of competitive swimming with the high demands of pursuing an IB Diploma. I would also have liked to hear how Ms. Arzave’s parents help support this balance. Also, Ms. Arzave wants to one day reach the Olympics, but is their another passion that she’s pursuing? Or is swimming her “day job” and education her extracurricular? Overall, it is nice to see coverage of such a notable achievement and I wish Ms. Arzave well on her swimming and her IOC.